Claudius V. Lebedev was a native of a simple peasant family. Since childhood, the young artist has shown interest in the history of the Fatherland and the church theme. Then he painted the walls and domes of the cathedrals, painted icons and illustrated the Bible. For many years he taught the basics of painting to young talents. Lebedev wrote his works in the style of realism. Many of his paintings reflect the life of the Russian boyars, features and way of life. In addition, Claudius Vasilyevich made a huge number of drawings based on folk tales. The artist maintained long-term cooperation with various publications, where his work was published. 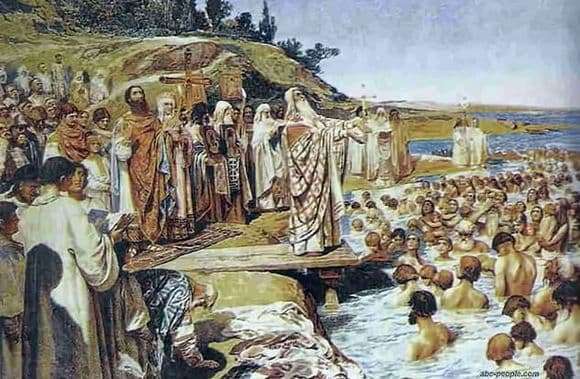 Among his famous canvases emit “Baptism of Kiev”. The work illustrates one of the most important events in the history of the state – the adoption of Christianity by the Russian people. The central figure of the picture is Prince Vladimir. Around him crowded the elders with icons, behind them is a cross. Many people plunged into the waters of the river. Among the audience are children, adults and old people. Reflected events are dated 988 year. This period is officially recognized as the stage of the formation of religion in Russia. However, it would be more correct to consider this as the beginning of the process, since the acceptance of the faith and its canons continued for several years after the baptism of Prince Vladimir. For a long time, everywhere Christianity met with resistance from the people. The reason for this was feudal fragmentation and unwillingness to obey one prince. However, after almost 50 years, the first churches begin to appear everywhere.